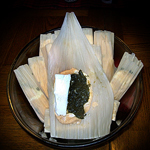 Our Vegeterian tamales are made with "Vegetable Oil" and have no "Lard, Chemicals, or Preservatives". They are the perfect menu addition to any holiday party or special event. When you pick up your order they will be fully cooked and ready to eat. However, If you'd like to store your dozen of Vegetarian Tamales you'll need to freeze then. If you just put them in the refrigerator they'll last about a week. But if you put them in the freezer they'll last about 3 months. We sell our tamales by the dozen. 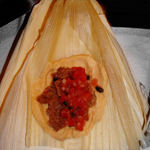 There is a discount on orders over 7 dozens tamales.